I had asked Desilets if he'd kept a checklist of complaints players of the first game had. I imagined there had been a list because, when I last spoke to the game's executive producer, Jade Raymond, about Assassin's Creed II in New York it seemed that all of the feedback about mission variety and pacing were being addressed. "For Assassin's Creed we received a real answer from the player," Desilets told me. He wasn't keeping a checklist but he'd heard the responses. He knew what the feedback was. That last game, acclaimed and popular as it was, was too routine, it confused people and it frustrated them. If what Desilets told me about what he and the 200-plus developers working on Assassin's Creed II for Ubisoft is accurate, most of that will be remedied by the sequel. But not everything — because Patrice Desilets is the rare video game developer who discusses taking the messages he gets from the gaming public and then sending them a message back. He's also still struggling with some key ideas that shape the works with which he is involved. Let's start with a lesson absorbed: The first game was, "too obvious," Desilets said, finding another way of vocalizing the critique that multi-million-selling Assassins' Creed proved to be too repetitive. "We never played with the game structure. At the beginning of the game, we said to the players there's nine guys to kill. You'll do your investigations first. You'll assassinate. You beat it. At the seventh one it's still the same, and never did we play with that. So that was the first thing I threw in the trash can. I was like, 'Let's forget about this game structure.' Let's really hide the game design elements of the game structure and more have a narrative structure that is the game structure." And here's a lesson resisted: The world of the old game frustrated collection-minded gamers, who discovered that there was no reward for finding all of the hidden flags in Assassin's Creed. And while Raymond told me in New York earlier this summer that there will be rewards for some collecting in Assassin's Creed II, Desilets informed me: "There are still some collectibles that are pretty useless." Then he laughed. My last meeting with Desilets, back in 2007, had been unusual and therefore memorable. He had shown up to my old offices at MTV with a review build of Assassin's Creed, and then hung out while I started his game. Review builds of games often come in envelopes and boxes but neither before nor since have they arrived in the hands of the lead creator of the game. He was as gleeful about his team's work then as he was when I talked to him again two weeks ago in Seattle. As Desilets laughed about refusing to offer rewards for every single collectible in Assassin's Creed II, I reminded him how happy he was to tell me back at MTV that flag-collecting in the first game did not yield rewards. "I know, and I still like it," he said in Seattle. "That's why I'm still smiling. And I know there's a big debate about that. I'm not a collector person. I don't collect a lot of stuff, so I don't get it. I don't understand." I suggested he was giving the finger to obsessive collectors. "It's not the middle finger," he said. "That's too [strong], but yes, I'm playing. I'm playing with them. It's a dialogue. I need to talk also. This time there'll be something else, but I'll still be smiling in my living room." Desilets is not an altogether stubborn man. He'll yield as he aims to please. He also admits he's changing. For the first Assassin's Creed Desilets was driven to explain away the artifices of game design. Why is a game character controlled by a controller? Because he is a remembered ancestor of someone else, manipulated by an advanced device called the Animus. Why are there game levels? There weren't. There were memories. Two years ago, making invisible the most game-y aspects of a video game was important to Desilets. He's softened. "I've let go a bit," he said. "I think in AC2 you'll find a lot more video gamey elements and I'm fine with it. The head's-up display, it's there. There's a lot more information. I realized it's important people understand. Some didn't in AC1 and we lost them. I don't want it to happen again." Desilets said players ran into unnecessary confusion in that last game. For example, they didn't understand which guards were eying their hero assassin. The new game adds icons that appear above the guards or at the borders of the screen to indicate the position of off-screen patrols. "That is video gamey," Desilets said. "And I can live with that in 2009. I'm getting older. I'm getting wiser." Older and wiser, Desilets does still feel the push and pull about how video-gamey his video games are. "It's still important for me that you get lost in the experience," he said, earnestly searching for the best way to express his ideas. 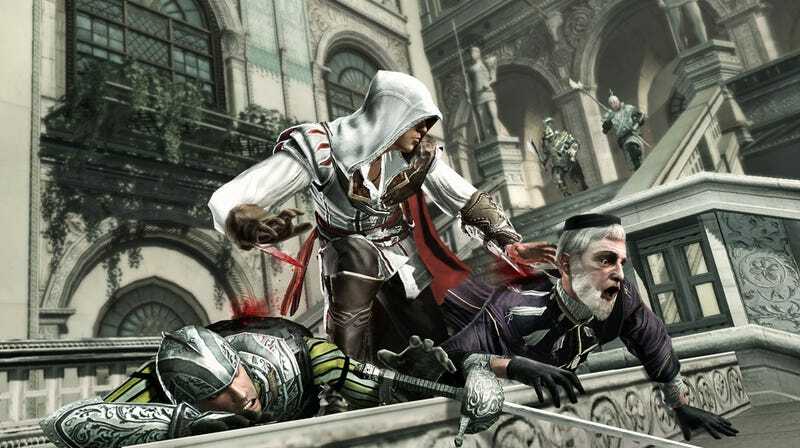 "Sometimes to me playing Assassin's Creed is not playing a video game. I don't want it to be. You're playing an experience." I pushed him to elaborate. He brought up another game. "Playing Hitman — and I have nothing against Hitman — It's not playing the fantasy of being a Hitman. It's playing a video game about a hitman and it's unfolding a puzzle. That for me is very gamey and something I don't want to do... [Assassin's Creed] is all about being this assassin in this period of time. It's not about being an assassin in a video game. I'll give you an example. I'm sure people would expect an assassin in a video game to hide in shadows. It's not about that. It's like: Those are video game rules. And for me, no, that's not what I want to be playing or experimenting. I'm more into an experience than a video game, but we've put a lot more video game elements into AC2 than AC1." Maybe the "video game" term is a label that is losing its relevance, he suggested. "We decided at some point in history that it's called a video game," Desilets said of the things he and thousands of other people in game development create. " A lot of stuff in video games are rules, common rules. You have to do it because it's like that. I think, the more technology enables us to create worlds, it will be less and less about video games. AC1 we went really far in that idea. Maybe too far for where we are. That didn't stop anyone from buying the game, because we sold a lot. But I know it stopped a lot of people from appreciating what it was. So this time around, I'll let go like I said." The dialogue, it seems, will continue, not just between Desilets and his customers but among Desilets' competing instincts as well. Assassin's Creed II ships in November for the the Xbox 360, PlayStation 3 and PC. Play it as a game. Play it as an experience. Just don't expect there to be a reward for everything you find within it. And know that while you're playing it, Desilets might be in his room, smiling, ready for your response.